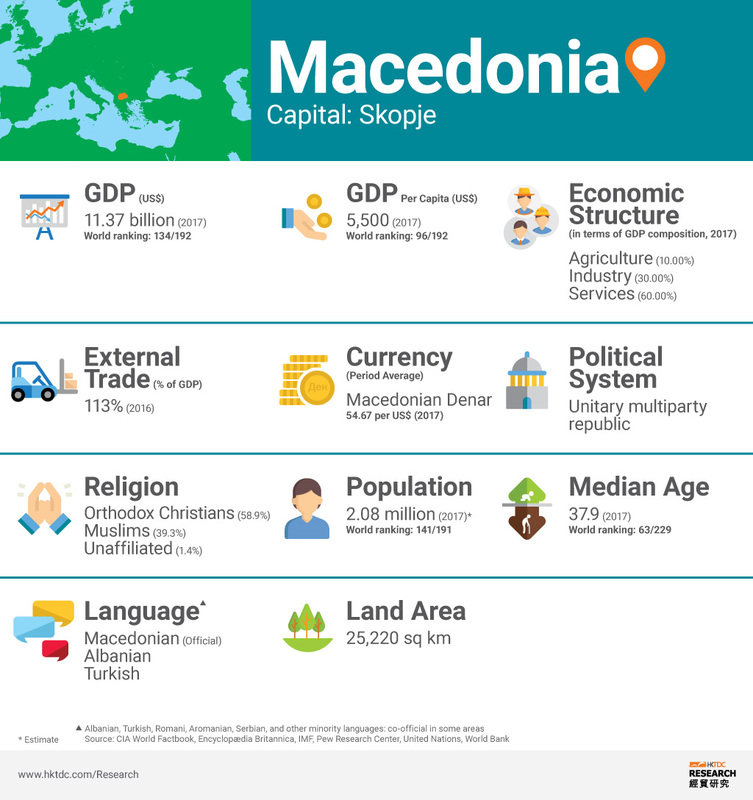 The Former Yugoslav Republic of Macedonia (Macedonia) is an upper middle-income country that has made great strides in reforming its economy over the last decade. 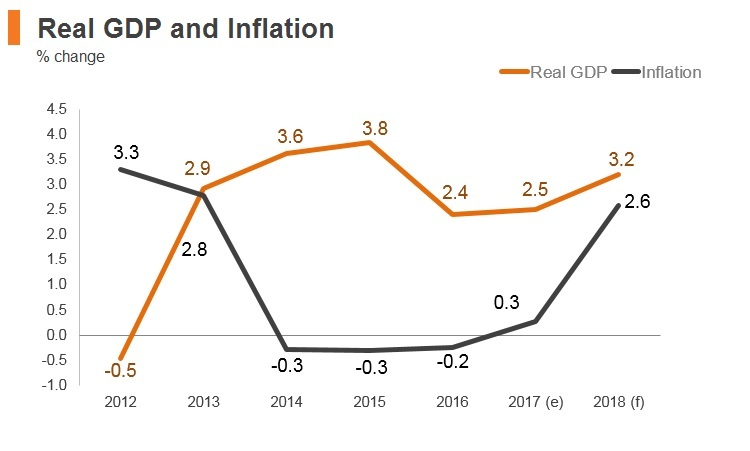 However, more efforts, including European Union (EU) accession and the implementation of structural reforms aimed at improving the business environment, are still needed to generate broad-based economic growth and improve living standards for all. An early election scheduled for June was postponed. Early general elections intended to end a two-year political crisis failed to produce an outright winner. Macedonia formed a new government for the first time in more than a decade. Macedonia's president refused to sign a deal with Greece to rename his country the Republic of North Macedonia, after parliament ratified the accord. A referendum where citizens vote on whether to change the country’s official name was scheduled for September 30, 2018. Macedonia joined the World Trade Organization (WTO) in April 2003. As a member of the WTO, Macedonia regularly notifies the WTO Committee on Technical Barriers to Trade of proposed amendments to technical regulations concerning trade, and as an EU aspirant, Macedonia is harmonising its customs laws with EU laws and regulations. On the political front, the unprecedented referendum, in which citizens will vote on whether to change the country’s official name, is scheduled for September 30, 2018. If a majority are in favour, a resolution to the longstanding political stalemate with Greece could finally come to an end. This would pave the way for EU accession talks, which could begin as early as June 2019, and a NATO membership invitation. 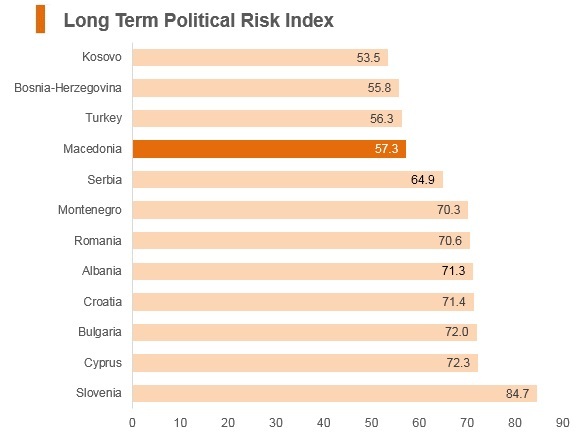 Macedonia's average tariff rate is the fifth highest in the South East Europe region (out of 12 states). 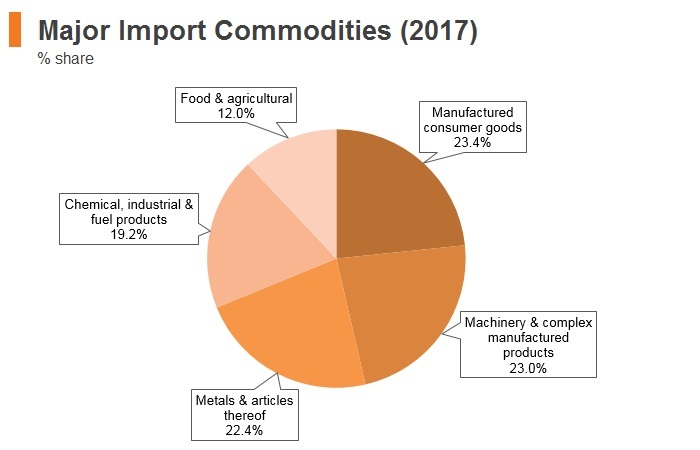 The average tariff rate on agricultural goods is 16% and 6% on industrial products, on average. 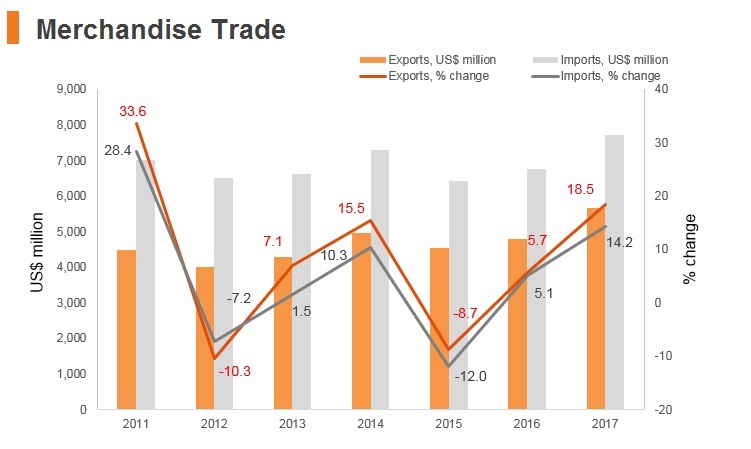 However, there are no discriminatory trade policies affecting foreign investors and almost 96% of total foreign trade is unrestricted. 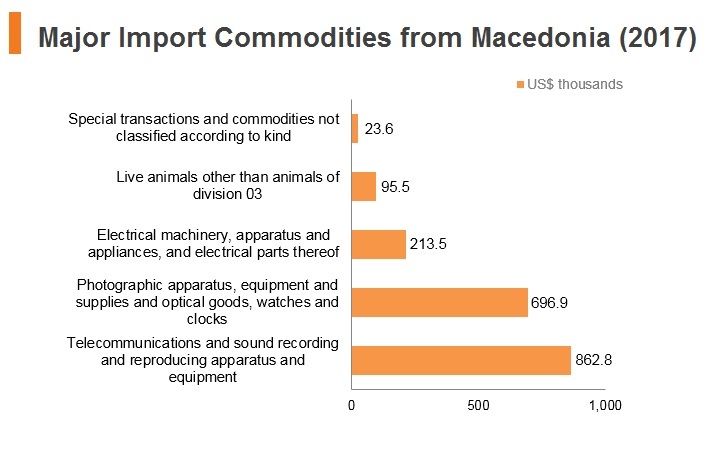 Customs duties generally apply to most products imported into Macedonia. 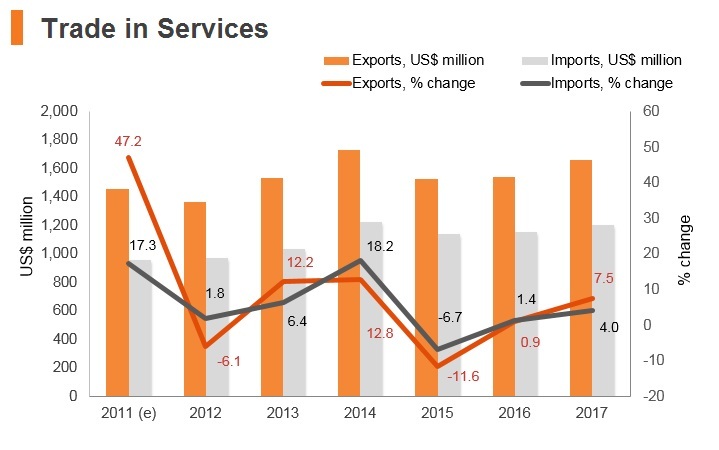 The customs rates under the most favoured nation treatment for agricultural products are up to 31%, whereas the customs rates for industrial products are below 23%. 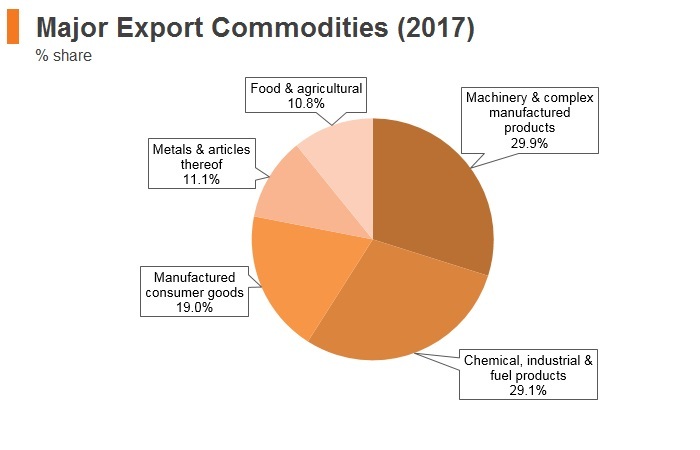 The import of industrial products with preferential origin and certain raw precious metals is exempt from customs duties. Macedonia has signed trade agreements with Turkey, Ukraine, and European Free Trade Association (EFTA) member states. The country is also a member state to the Central European Free Trade Agreement (CEFTA) and has signed a Stabilisation and Association Agreement with the European Community. 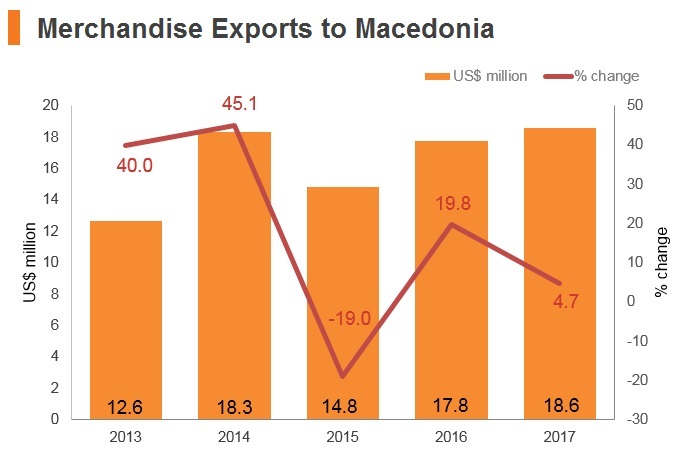 According to the Stabilisation and Association Agreement 2001 signed between Macedonia and the European Union, products with Macedonian origin can generally be exported into EU countries free of customs duties. Excise duties apply to alcohol, cigarettes, mineral oils, tobacco, petroleum coke and passenger vehicles, where these duties are determined by the type and quantity of the product and are levied in addition to the customs tariff. The customs tariff on new and used automobiles is 5%. However, there is no tariff on automobiles produced in EU countries. 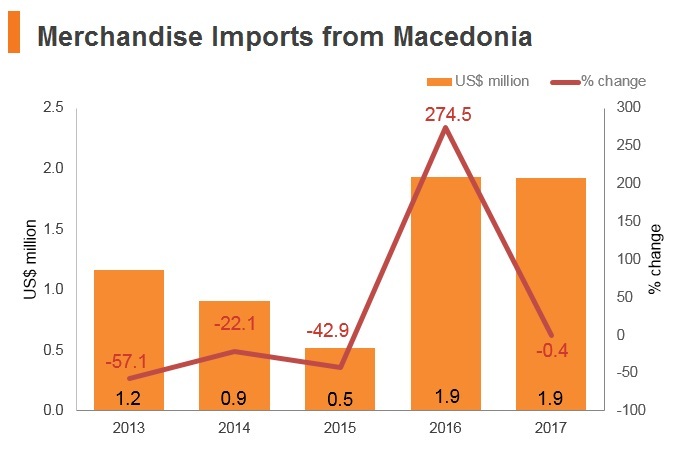 A number of products in Macedonia are subject to quality control at customs offices, to ensure that imported goods are in compliance with domestic standards. The products subject to quality control include the majority of agricultural products, cars, electrical appliances, and products in which poor quality may pose a health risk to consumers. When applicable, products must also pass sanitary, phytopathology, or veterinary control. Numerous import regulations that are not always available in English pose barriers to importers and exporters. 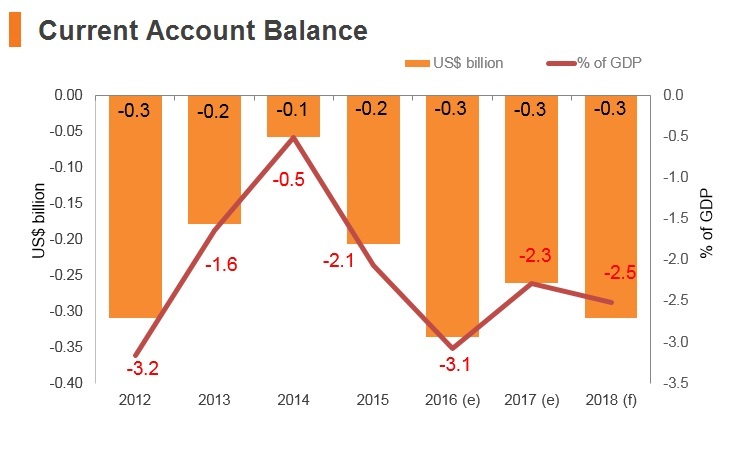 In May 2016, the Macedonian Bank for Development and Promotion lowered the export factoring interest rates from 6% to 5% per annum (a rate that is exclusively designated to benefit Macedonian exporters). 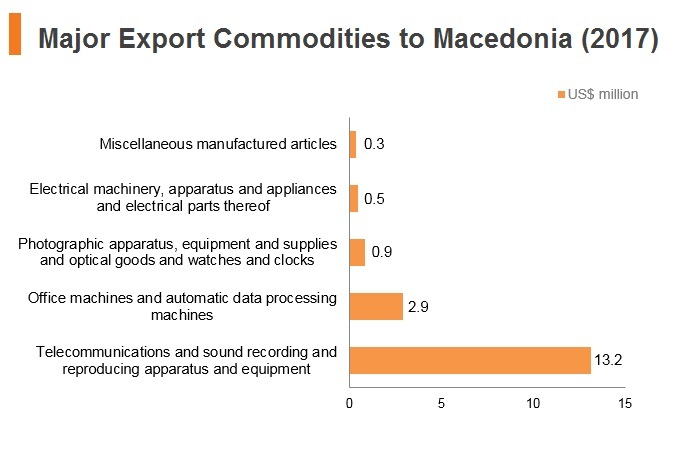 The export factoring interest rate is the rate at which Macedonian export-oriented business entities pay as part of the export factoring support (a form of trade finance loans with recourse, offered to businesses for their exporting activities) that the Macedonian Bank for Development Promotion offers to them exclusively. Trade and investment ties are likely to be increased between Macedonia and the EU, in the event that a diplomatic resolution is reached with Greece regarding Macedonia’s name. The CEFTA: CEFTA consists of Macedonia, Albania, Bosnia and Herzegovina, Serbia, Moldova, Montenegro and UNMIK/Kosovo and came into force in May 2007. The Agreement helps increase trade between regional counterparts and fosters non-EU bilateral relations. The bilateral free trade agreement between Macedonia and the EFTA: EFTA consists of Switzerland, Norway, Liechtenstein and Iceland and entered into force in May 2002. The Agreement covers trade in goods and provides Macedonia with key export markets for its primary and secondary sectors. The Free Trade Agreement (FTA) and Economic Integration Agreement between Macedonia and the EU: The FTA entered into force in June 2001 (for goods trade) and April 2004 (for services trade). The Agreements stimulate Macedonia's already large export and import volumes with EU member states, including Germany, Bulgaria and Greece. The bilateral Free Trade Agreement between Macedonia and Turkey: The FTA covers trade in goods and entered into force in September 2000. 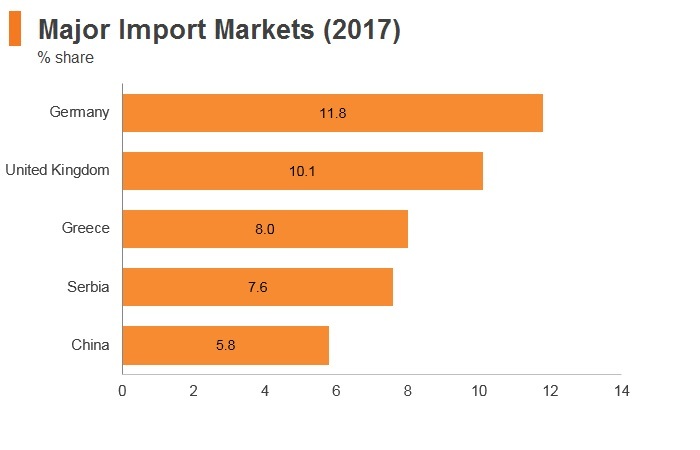 Turkey is Macedonia's seventh largest supplying market as of 2017, with imports from Turkey accounting for 4.8% of Macedonia's total imports, of which machinery, mechanical appliances, nuclear reactors, boilers and parts thereof made up the highest percentage. The bilateral FTA between Macedonia and the Ukraine: The FTA covers trade in goods and entered into force in July 2001. 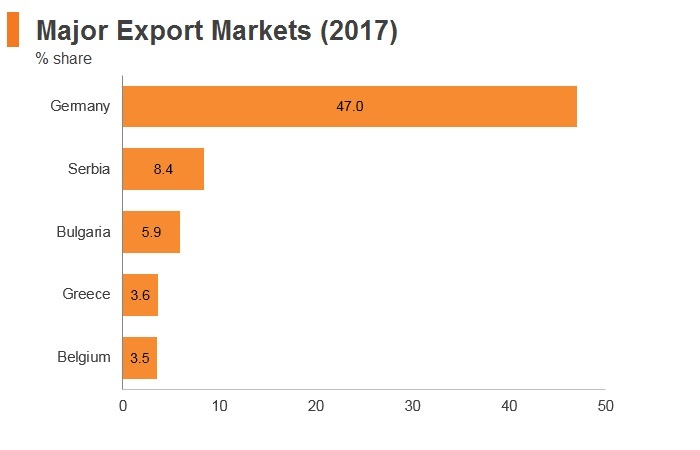 The Ukraine is Macedonia's 25th largest supplying market as of 2017, with imports from the Ukraine accounting for 0.9% of Macedonia's total imports, of which iron and steel made up the highest percentage. Invest Macedonia is the Agency for Foreign Investments and Export Promotion in Macedonia, and it is the primary government institution in charge of facilitating foreign investments in the country. 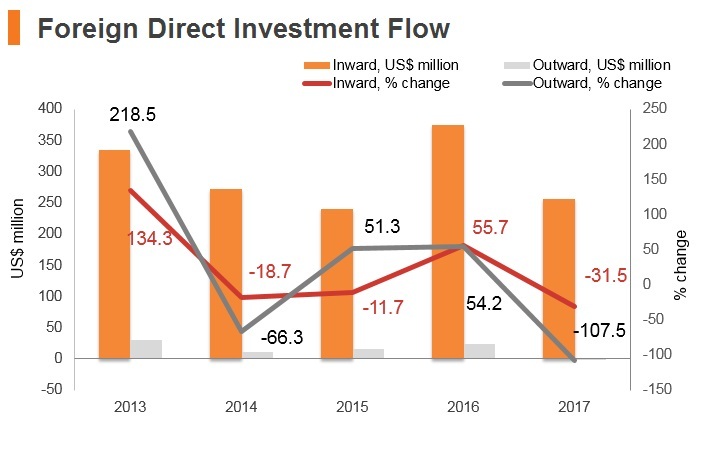 Macedonia is heavily dependent on FDI for employment and growth, so it welcomes foreign investment that can provide substantial numbers of jobs. Legislation places foreign and domestic firms on roughly equal footing, with foreign investors regularly receiving national treatment. The government also provides numerous incentives and has promised to institute transparent policies for attracting FDI. Macedonia has also adopted multilateral conventions protecting foreign investors, as well as concluded a number of bilateral investment protection treaties. Foreign investors are permitted to invest directly in all industries and business sectors, except those limited by law. Investment in the production of weaponry and narcotics is subject to government approval, and investors in industries such as banking, financial services and insurance must meet specific licensing requirements that apply equally to both domestic and foreign investors. Foreign investment may be in the form of money, equipment, or raw materials. According to the law, foreign investors have the right to receive the full value of their investment in the case of nationalisation, a provision that does not apply to domestic investors. 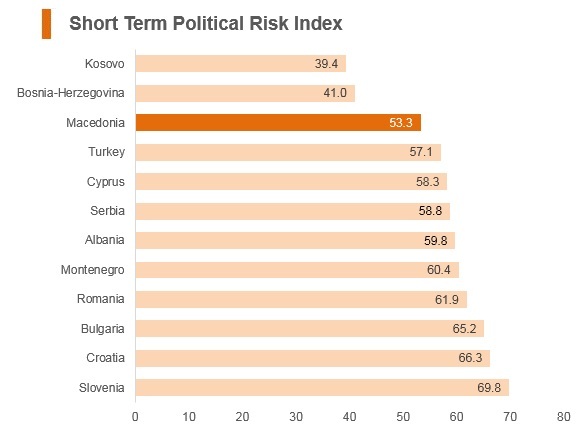 Indicative of its liberalisation efforts, Macedonia has created the most attractive tax system in Europe with a simple flat tax rate of 10% on corporate and personal income. In order to stimulate investment, corporate tax on retained earnings is set at 0%. Meanwhile, special tax incentives are offered for companies operating in the technological-industrial development zones (TIDZs), including a 10-year personal and corporate income tax exemption. Although Hong Kong’s investment in Macedonia is limited at present, the city started and completed the first round of Double Taxation Agreement (DTA) negotiation with Macedonia in June 2015 in a bid to accommodate greater synergies. The standard value added tax (VAT) rate is 18%. This rate applies to overall turnover and imports of goods and services. A lower rate of 5% applies to supplies of certain goods and services, such as supply of food for human consumption; food for livestock; drinking water from public supply systems; computers and software; agricultural material and equipment; wood pellets, pellet stoves and pellet boilers; baby products; school supplies (e.g., school backpacks, notebooks, pencils); pharmaceutics and medical equipment; publications such as books, pamphlets, newspapers and other printed material, except for publications mainly used for advertising purposes; transport of passengers; and accommodation services, bed and breakfast services, as well as half-board and full-board services provided by hotelkeepers in the country and similar activities. Foreign tax credit: The taxpayer is allowed a tax credit for the tax paid on foreign income abroad, up to the amount of tax payable for that income in Macedonia. However, a tax credit for the withholding tax paid abroad is allowed only if a double tax treaty (DTT) is in place and in case the Macedonian company obtains proof for the amount of tax paid in the foreign country. Reinvested profit: The Corporate Income Tax Law introduces a possibility for decreasing the tax base for the year for the amount of profit reinvested for development purposes of the local taxpayer. 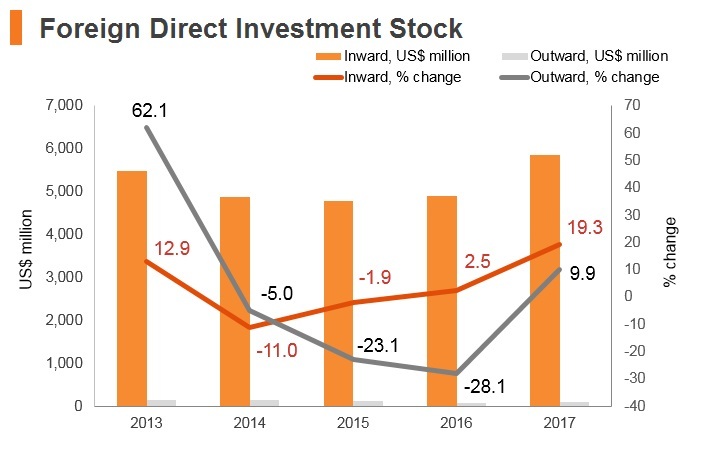 The amounts from the reinvested profit that would be recognised for the purposes of the above tax relief cover investments both in tangible and intangible assets, except for some explicitly listed types of assets intended for administrative purposes. In order to be able to utilise this tax relief, the taxpayers must maintain ownership over the assets purchased with the reinvested profit for a period of five years as of the day of their purchase. Technological industrial development zones: A taxpayer that is a registered user within a technological industrial development zone is exempt from CIT payment for a period of 10 years from the commencement of the performance of the activity in the zone or until the state aid amount is fully exhausted under terms and conditions and according to a procedure determined with the Law on Technological Industrial Development Zones. There are currently 15 Free Economic Zones (FEZs) throughout Macedonia that are at various stages of development. The Directorate for TIDZ is responsible for developing and supervising 14 FEZs, including two fully operational TIDZS in the capital (Skopje 1 and 2) and one in Stip (the largest town in eastern Macedonia). The Tetovo TIDZ is a public-private partnership (a privately owned company founded that zone and is responsible for its development and operation). - Foreign investors in the special FEZs may employ staff from any country. - Many companies temporarily assign existing employees from other foreign operations to start their branches in Macedonia. - In 2016, the Macedonia government simplified the procedure for expatriates to obtain permission to live and work in the country. - It also simplified regulations and procedures for large foreign investors in special FEZs. - Although legally permitted, there are no unions in the factories operating in the FEZs. - Large foreign companies operating in TIDZs generally report positive experiences doing business in Macedonia and good relations with government bureaucrats. General incentives - The Law on Customs and the Law on Profit Taxes offer incentives, such as tax breaks and subsidies, to foreign investors for projects that generate jobs. - Foreign investors are eligible for: profit tax exemptions for profits generated during the first three years of operation in proportion to the amount of foreign investment; all profits reinvested in the company; profits invested in environmental protection; and profits invested in 'underdeveloped' regions of Macedonia. - Companies with at least 20% foreign capital are exempt from customs duties for the first three years after their registration. - 10% flat tax for corporate profits and personal income. - Guaranteed relief from local taxes and fees. - A tax exemption for duties on imported goods, raw materials and equipment/machines. - A symbolic land lease rate. - Direct state aid in the amount of up to EUR500,000. Brownfield investments may benefit from some tax exemptions on employees for around two years. Employment of foreign citizens is regulated by the law on employment and work of foreigners. Labour laws apply to both domestic and foreign employees, where both are equally protected. There is no limitation on the number of employed foreign nationals or the duration of their stay. Work permits are necessary for foreign nationals, and an employment contract has to be signed upon hiring. A number of international businesses have reported that the processes of obtaining visas and work permits are challenging. Foreign nationals from North America, Europe, and some parts of Latin America, Africa and Asia (including Hong Kong) do not require a visa for visits to Macedonia of up to 90 days. 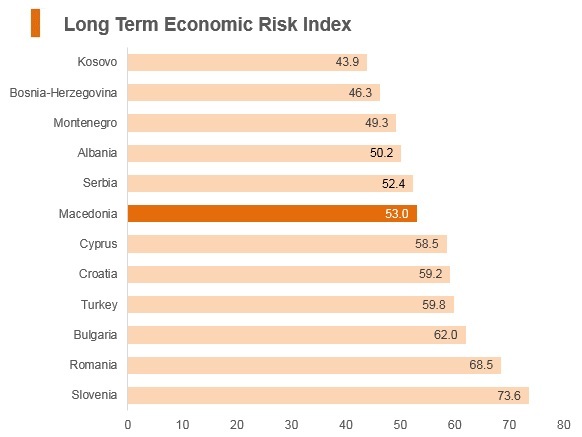 High structural unemployment weighs heavily on the Macedonia’s economic risk, despite higher economic activity on account of a robust construction sector. The political environment weighs significantly on investment confidence, and in 2017, gross fixed capital formation contracted by 4.5% y-o-y. 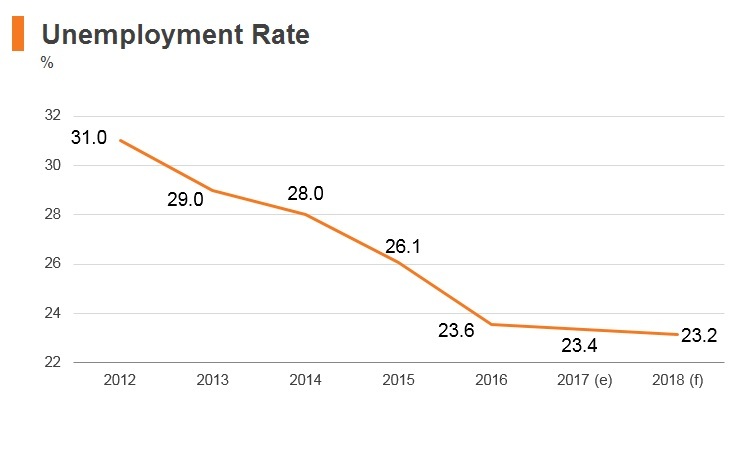 Although the registered unemployment rate has dropped below 25.0% since Q113, it remains elevated. As a landlocked nation, Macedonia’s sea transport relies mainly on ports in neighbouring countries - such as Port of Thessaloniki in Greece and Port of Durrës in Albania - through road and rail links. However, with direct flights to many major cities, Macedonia is well connected to the rest of Europe, the Americas and Asia, via its two airports in Skopje and Ohrid. Macedonia also has a well-established automotives sector, supplying to Western Europe, Russia, Turkey and Africa. It also has a well-established pharmaceuticals industry, supplying primarily finished generic products to more than 30 countries in the region and beyond. 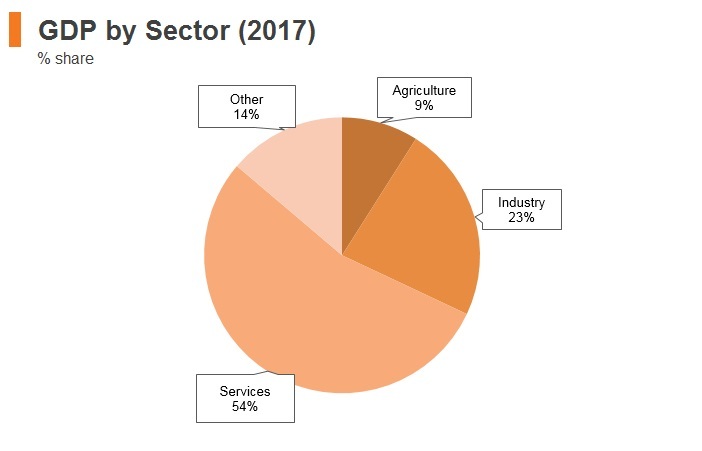 These sectors together with the agribusiness and food processing, ICT, textiles and clothing and electronics industries are therefore also key sectors for foreign investment. That said, heightened political tensions threaten Macedonia's business environment and could undermine the country's EU accession ambitions. The Agreement between the government of Macedonia and the government of China concerning the encouragement and reciprocal protection of investments entered into force in November 1997 and aims to create favourable conditions for investments by investors of each contracting party. The Agreement between the government of China and the government of Macedonia on the promotion and reciprocal protection of investments entered into force in June 1999 and desires to create favourable conditions for greater economic cooperation and investments on the basis of principles of equality and mutual benefit. The DTA between China and Macedonia was signed on June 9, 1997 and entered into force in both countries on November 29, 1997. HKSAR passport holders do not need a visa for a stay of up to 90 days.